Q:How do I adjust the time set in the X5's GPS module? The GPS module will automatically fetch the time from the satellite signals and thus you don't need to change it. It will auto-adjust the time once it acquires GPS signals from three of the (3D) satellites. Q:How do I register my X5? Q: Why does the X5 fail to retrieve GPS location? First, allow the unit to reacquire GPS satellite signal. If the unit is still unable to fix your current position, it is recommended to check if there are tall obstructions around you, such as elevated roads, high-rise buildings, and the like. Or you can reset the GPS receiver and find your position again in an open area. Q: How do I connect it to peripheral devices? 1. Go to [Settings] > [Wireless Sensors] > [Heart Rate Belt] or (Bike Name)* to see other sensors (Speed/Cadence/Combo/Power Meter). 3. Please power on or wake up the wireless sensors. Sensor IDs will shortly appear on your screen. 4. Click on the desired ID and wait for the current connected device to display a number. 5. Go back to the previous menu. You will see the corresponding number of the sensor once the connection is confirmed. 6. Start your workout. The sensor values will change based on your physical condition. Q: How do I remove the peripheral sensors (e.g. heart rate belts)? 1. Enter the wireless sensor options. You will see an ID number displayed under the current connected device. 2. Press and hold the number to remove the pairing. Q:No Internet access after connecting to 3G. 1. Go to the Internet connection settings to confirm that the carrier is correct. If no carrier is found, you can assign one manually. 2. Verify that the Access Point Name (APN) is correct. Q:How do I do Group Rides? 1.Please switch to the navigation mode, and enter the Quick Menu, then [Navigation Mode Settings] > [Group Ride]. 2.You can create or join Group Rides there. Q:How do I enable smart video recording? Go to the Quick Menu> [Device Settings] > [Smart Video Settings] > [Auto REC], and specify the conditions you wish to shoot under. Q:How do I adjust the length of the video? Go to the Quick Menu> [Device Settings] > [Smart Video Settings] > [Recording Duration] to adjust to 3, 6 or 9 seconds. Q: How do I plan a new route? 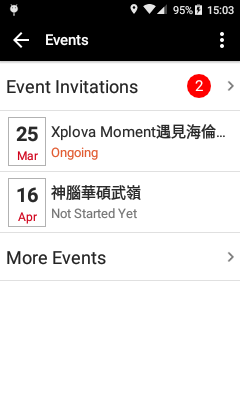 Please log in to www.xplova.com, and then select [Routes] > [Plan Routes]. Q:How do I update the software? Settings > System Settings > About. Select "CHECK THE LATEST UPDATE" to download and install software updates automatically. Q:How do I change the display from kilometers to miles? Go to [System Settings] > [Units] and change from the Metric system to the Statute system. Q:How do I adjust the backlight timeout? What are the options? How do I turn on auto brightness? 1. Go to [System Settings] > [Display] > [Backlight On] to specify a duration for the backlight. 2. The five backlight on options include: 15 s, 30 s, 1 min, 2 mins, and Always. Q:How do I find Smart Signs? 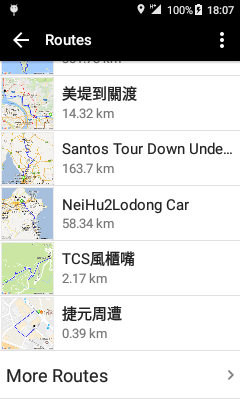 Go to [Profile] > [Routes] > Select a Route marked with Smart-Sign (the quantity and information of your points of interest are also shown) > [Ride This Route] > Press the [Up] key to toggle and bring up the Smart-Sign menu. Click on the Smart-Sign markers to learn more about the places and their positions on the route. Q:How do I find the Altitude Chart? After selecting a bike route, press [Ride This Route] > Down key to toggle and bring up the Altitude Chart, where you can zoom in/out for detail changes on the terrain. Please enter [Internet Connections], [Wi-Fi Settings] again, and choose a higher-speed wireless network from the selection menu below. Q: When should I do Altitude Calibration? The X5 measures altitude using a barometric altimeter, which is highly sensitive to changes in air pressure and temperature. To ensure the accuracy of the altimeter under changing weather conditions, it is better to manually set the altitude instead of auto adjusting by GPS. Please find a location with a known altitude, or make a query in Google Maps/Earth and place the X5 at the location. Enter the Quick Menu > [Altitude Calibration] > [Disable Auto Calibration] > [Select Altitude], and press the pen icon at the upper right corner to edit the altitude reference point. Up to three points can be chosen for quick altitude correction. Q:How do I upload video? Go to Quick Menu > [Profile] > [Activities] and select the wanted activity record while Internet connected. If you have recorded a video, from the bottom of the list, select [Create Video] and the unit will prompt you to generate, preview and upload the video to the Cloud. Once completed, a "video" icon will show after the name of the recording. Q:How do I share a video on Facebook? Once you have uploaded a video to the Cloud, roll down to the bottom of the selected Activity Details, and it will show the completed live video. Click on […] on the lower right of the video > [Share] > [Facebook], and log in to Facebook to share your live broadcast. Q:How many three-second video clips can the X5 take? If the X5 is pre-loaded only with the map of Taiwan, more than five hundred 3-second videos may be taken. Q:Can the X5 shoot for extended periods of time? The X5 has a built-in camera that features 3/6/9 second video recording, and thus provides users with different shooting options. Includes the main unit, a bike mount , a USB cable, and related user manuals. Q:Does the X5 require a SIM card for the 3G Internet connection? Q:What if the 3G connection disappears? Will the X5 keep the records? Though the X5 disconnects from the Internet, the system will keep sending connection requests on a regular basis. So as soon as it reacquires a 3G signal, it will upload your videos as usual. Q: Is the charging cable of the X5 identical to that of a cellphone? Yes, any standard Micro USB cable for Android devices will work. Q:Do the Xplova products, such as the Heart Rate Strap and 2-in-1 Combo Sensors, connect to other competing products? Yes, they are compatible with all ANT+ wireless-enabled sensors. Q:Are detailed specifications of the X5 available? Q:What is the difference between the X5's OSM and Google Maps? 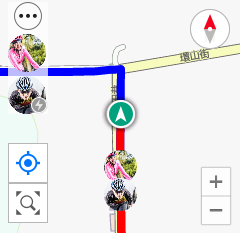 They belong to different map system, and both give clear guidance on bike routes. OSM Maps can providing maps of detailed cycling routes and mountain trails. 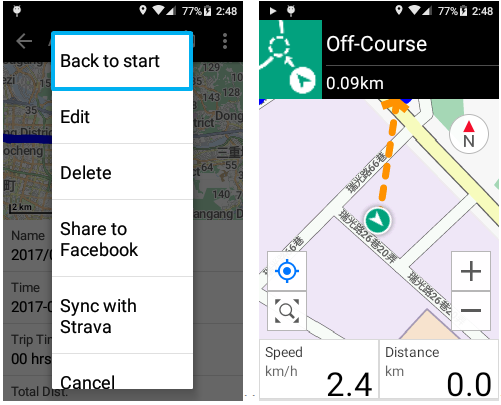 Q:How to sync your X5 activities with Strava? 1.Yes, you can upload a record of every completed ride to Strava via the Xplova website. 2.Please apply for a Strava account. Q:What built-in languages does the X5 have? The X5 currently supports Traditional Chinese, English, German, Italian. (support for more languages is planned for the future). Q: Can I share videos from the X5 to Facebook? Yes, You can sharing on Facebook. Q:Is there a charge for the X5's map downloads? The OSMs for the X5 are currently free; all customers are welcome to download them. Q:Can other software be installed on the X5? No. This is in order to prevent other software from causing the device to crash. Q:Can I change the background color to black or white? Yes, the background can be manually changed to suit your preferences (but if the system is set to auto-adjust, it will display white during daylight hours, and change to black at around 6 pm). Q:Are there offline maps available for the X5? Yes, the OSMs Map can be downloaded and used offline. Q:Does X5 have NFC transmission capability? No. Because NFC only works over a limited distance, the unit does not include this feature. Q:Can I join the same Group Ride by using either the X5 or the Moment app? 1. Change Routes: You can change to another route while recording and continue recording using the same record! While recording, select the route you want to switch to. After route confirmation, X5 will display a pop-up prompt window asking you if you want to discard this record. Choose "Continue" at this time to change routes and continue with the same record! **The same thing can be done for event routes. You can switch to a different event to change to the route you want to continue recording with. 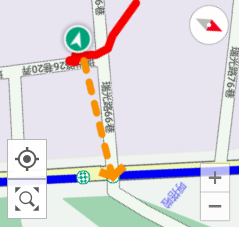 *If the record started without loading a route, you can also select a route and tap "Continue" when prompted to continue recording. *Completion rate in the rankings is calculated based on the last route loaded in the record. 2. Resume Recording: During recording, if you press and hold the power button to force X5 to shut down, or it shuts down due to low battery, a prompt message will pop up the next time X5 is powered on. The message will ask you if you would like to return to the ongoing workout. Tap "OK" to continue recording with your last recording. On breaks during a long trip, you can power off and charge X5. After the break, simply power on X5, and you can be on your way. X5 will resume recording using the same record! *Important Note: After reboot, if you choose "Cancel" when the prompt message is displayed, the unsaved record from last time will be discarded. To save previous records, please choose "OK" when the pop-up window is displayed after reboot, then end the record manually. 3. Added Physical Button Control to Message Prompt Windows: You can now use physical buttons instead of touch control when prompt messages show up during trainings. a.Left/Right Arrangement: Press the Mode button on the left-hand side of X5 to select the option on the left. Press the Down button on the right-hand side of the device to select the option on the right. b.Top/Bottom Arrangement: Use the Up button on the right-hand side of X5 to select the option on the top. Use the Down button to select the option on the bottom. c.Left/Center/Right Arrangement: Press the Mode button on the left-hand side of X5 to select the option on the left.Press the REC button to select the option in the center. Press the Down button on the right-hand side of the device to select the option on the right. 4. Smart Map Download: When you open the route information, the system will determine if the maps along this route have been downloaded. If not, it will remind you to easily click to download the required map for that location! 5. Lap Markers: X5 can now add lap/split markers on the maps with activity details. You can check your per-lap performance directly on X5 after ending activities! 6. 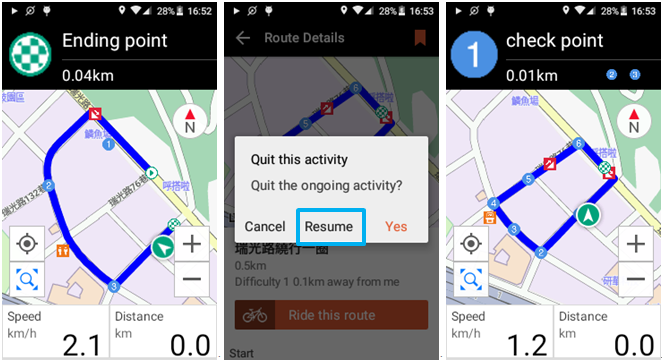 Advanced Navigation Notification Functions: When riding along a route, you can make further adjustments to the navigation notification settings for that route. 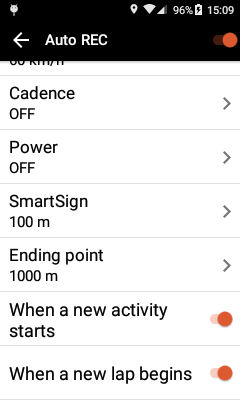 In addition to disabling the current activity track, you can also enable or disable individual navigation notifications (Turn Guidance/Off-Course Warning/SmartSign Guidance)! 7. 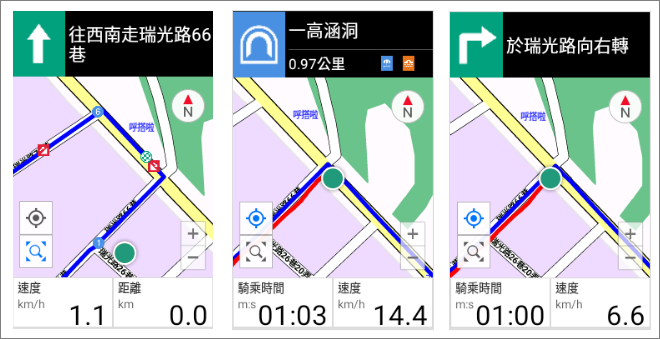 Moved "Position" Icon Downward in "Forward" Mode: When compass mode is "Forward", the "Position" Icon will adjust its own position downward to provide a better view of the route info for upcoming routes and conditions. 8. 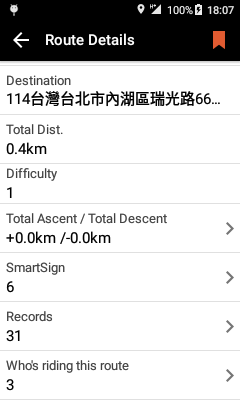 Altitude chart and SmartSign location listing refresh time is adjusted to 10 seconds, allowing faster understanding of the condition between the current route and recently-passed/upcoming SmartSigns. 9. Adjusted Alert Reminder Settings: When alert conditions are met during recording, X5 will display an alert message. The message disappears automatically after 3 seconds. If multiple alerts are triggered in succession, X5 will only display new alert messages after 10 seconds have passed. This means, the main screen will no longer be flooded by successive alerts! 10. Added Range Criteria to Alert Settings: You can now set alerts to trigger when your heart rate/speed/cadence/power exceeds the range you set, helping you keep an eye on your conditions and provide reminders if workout targets exceed set ranges! 11. 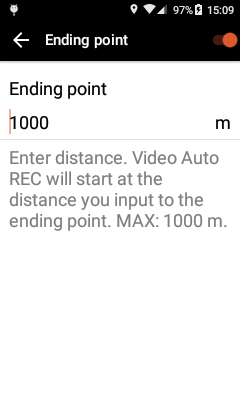 Total Distance Traveled: You can now modify the total accumulated distance traveled on your bicycle. Ride on towards your next goal! 12. Uploaded Activities Summary is now provided in shorter intervals of an hour or smaller. 13. Please disable the GPS function when using an indoor bike trainer. This will clear the GPS location data. 14. When the speed sensor displays abnormal speed values, X5 will switch to the GPS speed automatically. 15. Corrected accumulated tunnel distance calculation method. Tunnel distance will now be calculated using the straight-line distance between the two ends of the tunnel and added to the record after passing through the tunnel. 16. TSS/IF now shows two decimal places for increased precision. 17. Turn guidance notification distance is adjusted to 100 meters. 1. 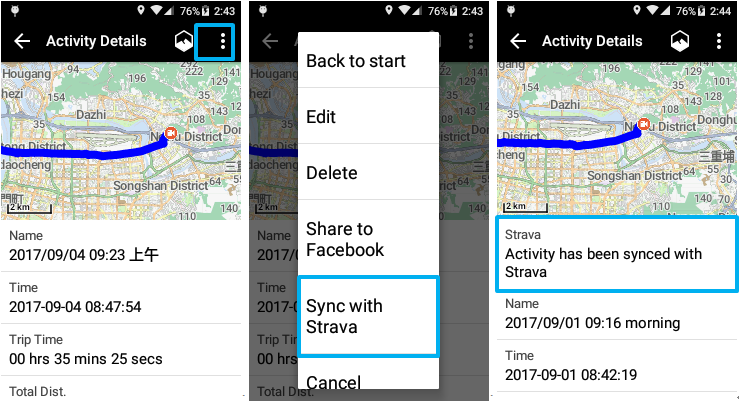 Added the ability to sync with Strava: After logging in to your Strava account from “System - Settings”, all your X5 activity records uploaded to Xplova will be also synced to Strava! *X5 does not support Strava's login from Google Account. 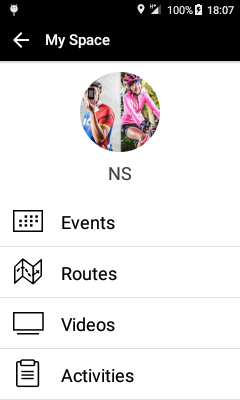 If you access Strava as a Google Account, we recommend that you use this "upload to Strava" feature from the Xplova site. Thank you for your understanding. 2. 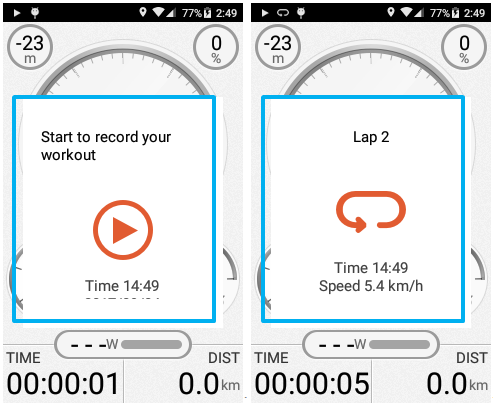 Uploading a single activity to Strava: Choose the activity you want to sync, and then choose “Sync with Strava”from “…”; the “Strava” field for this record will now show that the record has been synced. 3. 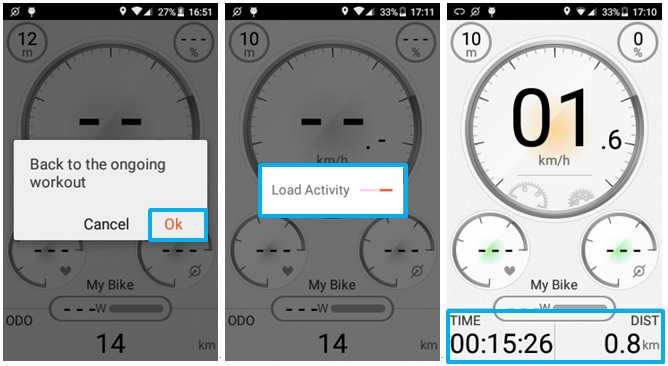 Added support for Shimano Di2 pairing and gear information display: Choose this sensor from “Wireless Sensors” and pair it to the X5; then go to “Bike Settings” to enter your gears and flywheel info. 4. 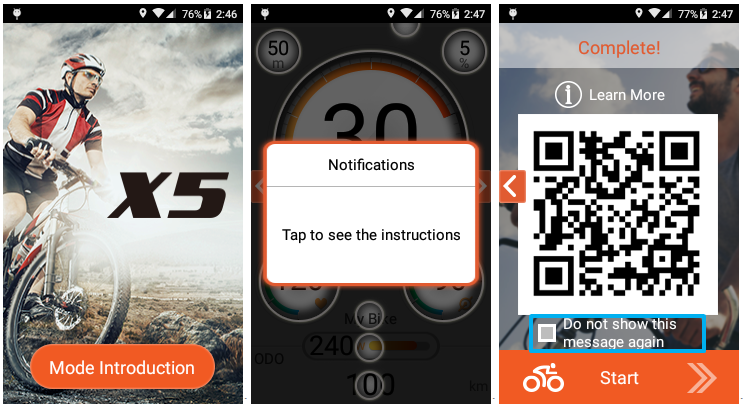 Tutorial for the X5 Tips and power-up notification: Now you can access the “X5 Tips” from settings to watch a tutorial for the different Operation Modes on your X5! After entering the tutorial, you can choose the function or button that you want to learn about; relevant hints will appear for 3 seconds to guide you through the function step-by-step. After finishing the tutorials for Device Mode, Navigation Mode, and Training Mode, you will be able to easily understand all the Operation Modes on the X5! *X5 Tips will open by default every time at power-up. If you want to remove this notification, just choose “Do not show this message again” at the end of the tutorial to cancel the power-up notification. 9. Added function to choose and arrange videos at will in the video editing tool. 10. French and Dutch UI added. 11. New data field added for “Power”: Power-Normalized Power (NP) and Power-Intensity Factor (IF). 12. Pre-set bicycle gears to choose from, which simplifies the setup process. 13. Added function for basic editing of data fields. Press and hold on the field you want to change to edit its contents. 14. Other bug fixes and system improvements. 1.Route ranking: Now you can select a route to check how you and your friends fare against others in the route ranking. Tap on Personal Ranking to see if you are in the short list, or tap on Overall Ranking to check everyone else. 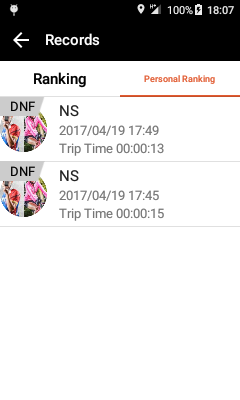 If you didn’t finish more than 90% of the route, the sign “DNF” will be shown on your records in the Personal Ranking and this record won’t be shown in the Overall Ranking. You could challenge the route again and reach the completion rate of 90% to get your records in the ranking! 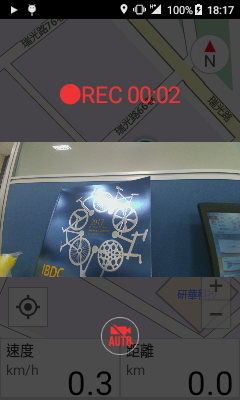 2.Auto-REC improvement: When auto-REC is on and while video is recording, a red button will pop up on the screen. You can tap this button to deactivate auto-REC for this ride. When you start a next workout, it will go back to your original settings. 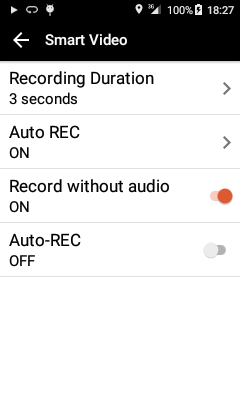 3.Record without audio: Taking video will now default set to be “record without audio”. 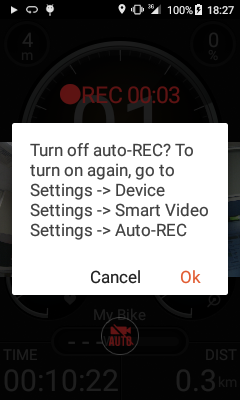 You could go to smart video settings to change the setting if you want to record with audio. 1. 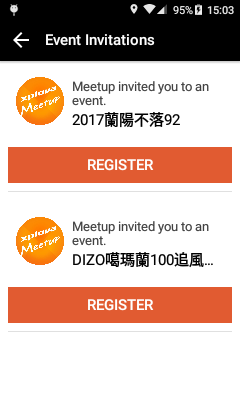 Event Invitation Notifications: Event invitations you received will now be shown on X5, so you can easily view and join the events. 2. 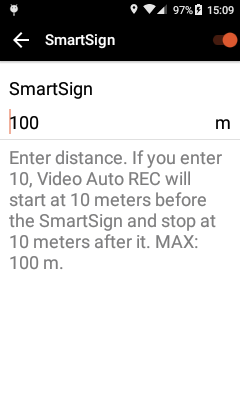 SmartSign & End Point Auto REC: Smart videos can be triggered once riders approach the SmartSigns or end points at predetermined distance. 3. Off-course Route Guidance: Riders who go off course will now be automatically directed back to the route by a helpful arrow shown on screen. You don't have to worry getting lost anymore! 4. 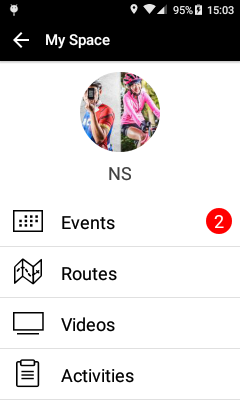 Fellow riders' status(offline/pause/idle) will be shown on Live Tracking/Event Tracking pages to keep you always informed of their real time conditions. 5. The green dot showing your location now also indicates your direction with an arrow pointed forward. 7. 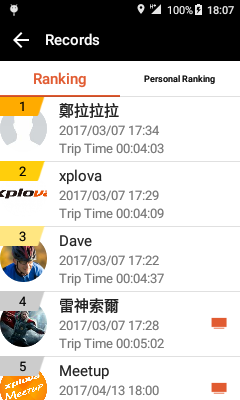 Add "Confirm" request on screen when riders press STOP to avoid quitting workouts accidentally. 8. Add guidances to the start point when activating challenge mode. 9. Improvements and bug fixes when the map is heading forward. 10. Other improvements and fixes. 1. Challenge Mode: Now, you can challenge any public records or your past records and friends' public records! Moreover, you can see the relative position and distance of each others, etc..
2. Route Guidance*: Getting turn by turn navigation guides ahead within proper distance before reaching any road forks. 3. 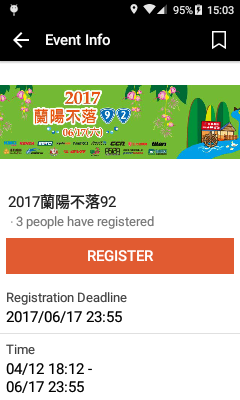 Event tracking: Join the event and start to ride. You can view and track each other’s positions in the navigation mode as soon as they all join the event and start riding! 4. Add custom data fields (Lap Power, Lap Max Power,L-Lap Power,L.L Max Power, Lap Max Cad. and L.L Max Cad.). 5. German and Italian language operate and display. 6. Hong Kong map available for download. 7. Auto-upload and adding multiple videos functions are available now. 8. The correction and improvement of other operational issues. Q:What are the sales channels for the X5? Please visit Store.xplova.com. Customers are welcome to visit these locations to learn more and to make purchases. Q:What is Xplova X5 warranty? Q: Is there an user manual for the X5? Yes, please see the enclosed manual. You may also download it from www.xplova.com. Q:What is the X5 customer service number/e-mail? Q: If an Xplova product's warranty has expired or is not in effect, are there any additional costs incurred for repairs? If the product is not within the duration or scope of warranty, the cost of parts and labor for repairs will be charged to the customer. Our customer service team will provide you with an accurate price quote. Q:What's the warranty period for the X5's accessories? The main body of the accessories, such as the ANT+ Heart Rate Belt and ANT+ Speed-Cadence Sensor XA-CS2, is subject to a one year warranty period. But the warranty does not apply to the related consumable parts such as the Belet forXA-HR2 and Cadence magnets. This is because their lifespan is dependent on their frequency and pattern of use. We therefore recommended replacing these parts periodically. Q: Is overseas after-sale service and warranty covered for my X5? Similarly, there is a one-year warranty period from the date of purchase invoice. Q: Where can I get repairs in Taiwan if the X5 is damaged? Q:Where can I get repairs in areas outside Taiwan? Please visit Store.xplova.com for detail information. Q:Does the X5 have a repair center overseas? We recommend you search at the Xplova Store. Q: Where can I buy the Xplova Bike Ties? Q:Where can I get the latest news and info about Xplova? Please visit Xplova's Facebook for detail information.